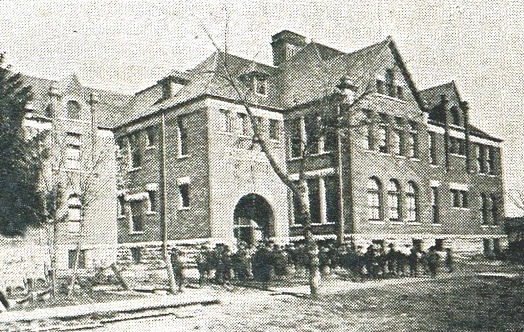 The property at Third and Prairie had been a school site from at least 1866. That was when the first First Ward School was erected there. 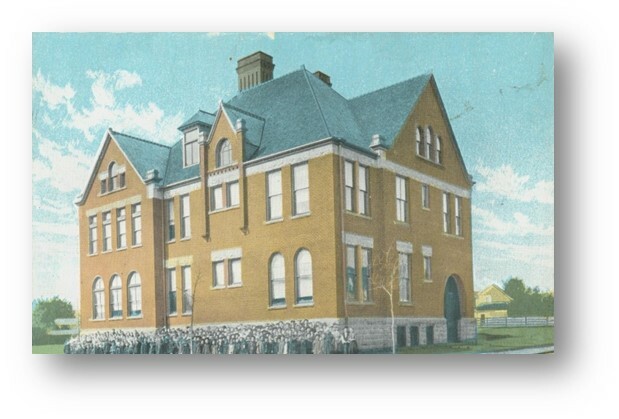 It was renamed Hall School in 1884 and a new Hall School was erected in 1892. The building pictured below is the 1892 building. No picture has been found of the first First Ward School from 1866. The school closed as a grade school in 1970 and became the Hall Adult Education Center in 1971. The building was demolished in 2003. All that is left of the school is the chiseled name that must have been above the main door. Someone on the work crew demolishing the school must have saved the inscription and placed it in the ground on the corner of the lot, like a flat gravestone. Weeds began to grow and soon the stone was breaking and spreading. We "de-weeded" and took the picture at top. The school was sold to Hugh Deery in 1982 and to Ralph Littlefield in 1994. It was demolished in 2003. Today (2015) the property is an open lot.